Please consider supporting our clients by donating items from our wish list. We’re in need of hygiene product kits to distribute to homeless seniors, adults, and families who visit our Family Shelter and Francis House Center. Items should include toothbrushes, toothpaste, soap, lotion, shampoo, sanitary napkins, brushes, combs, hand sanitizer, nail cleaning supplies, shaving supplies, etc. We accept travel sizes, standard sizes, or partially used products (except for toothbrushes, razors, combs, or brushes). It is an electronic card that you use at Save Mart, FoodMaxx, Lucky, or S-Mart foods. Each time you use your assigned card, 3% of all qualified purchases is automatically credited to Next Move. Present the S.H.A.R.E.S. card to the cashier before you begin your transaction. Your receipt will show the number of points earned for that transaction and the monthly total of points earned. Every Swipe Counts! It’s that easy! Through the S.H.A.R.E.S. 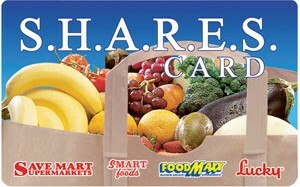 card, Save Mart donates up to $12 million annually to its communities.